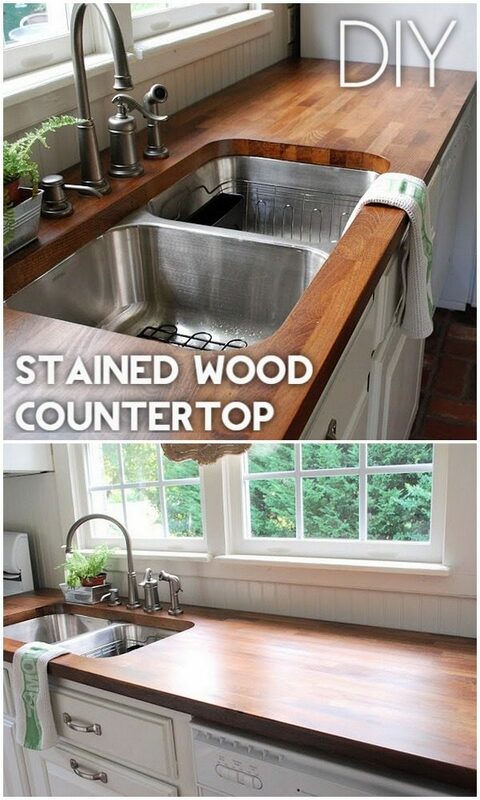 Looking for DIY countertops to revamp your kitchen? It’s a big home project, and you need to get ready for it properly. These 20 tutorials will help you. One of the highest impact kitchen renovation projects you can do is to update an old countertop. It may be an old laminate countertop that’s already worn out and chipped, so painting it, replacing it with a different material or otherwise improving it will completely change the look of your kitchen for the better. And while replacing the kitchen countertop with marble or granite can be rather expensive, you can get virtually the same result with a DIY countertop. 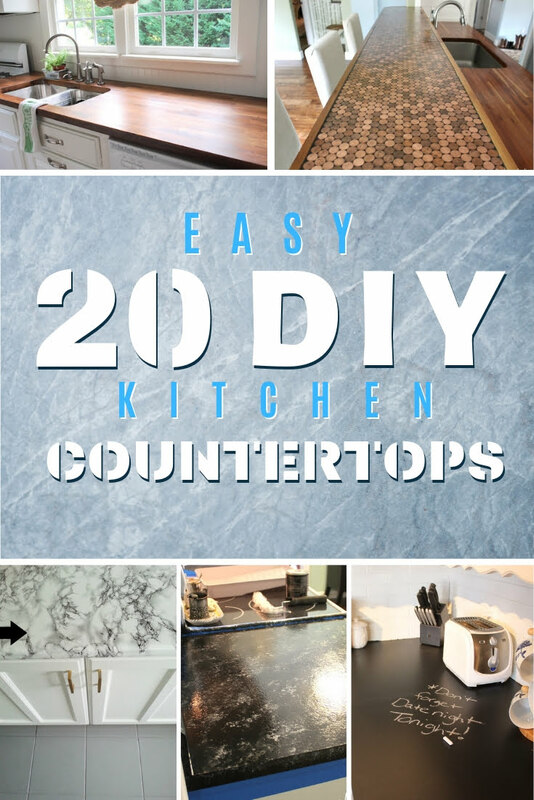 We have assembled a list of 20 great tutorials that you can use to make your countertop at home. All you have to do is get the needed materials and tools, and you’re all set to create your kitchen project. It’s easier than may seem, so we encourage you to choose a tutorial of your skill level and get on crafting! 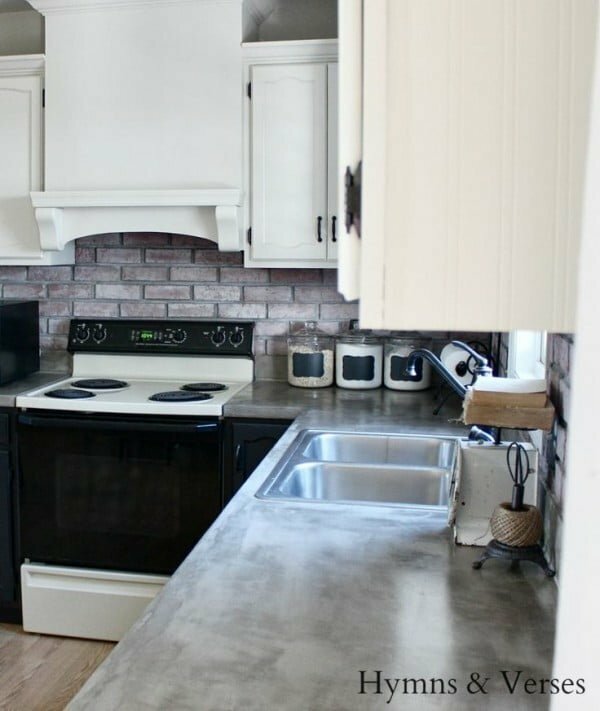 Concrete is cheap, and it looks good with an industrial style accent in your kitchen decor. But making one can be quite an involving project. 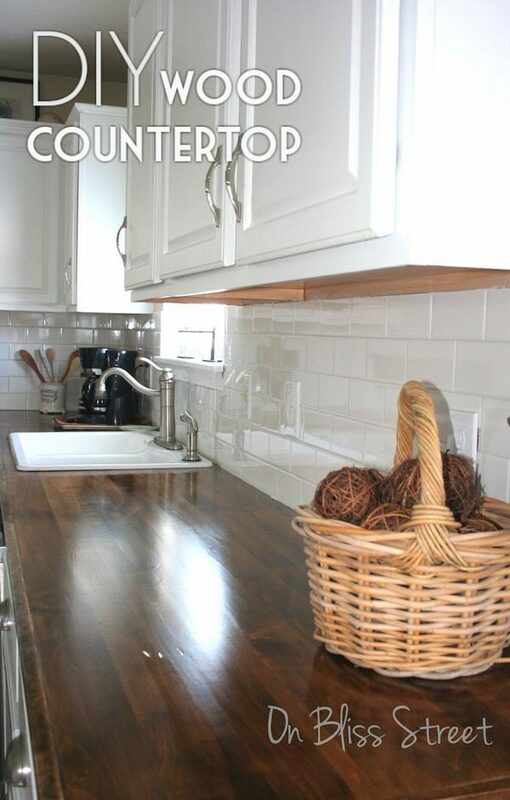 Here’s a project to get the same look by updating your laminate countertop without having to replace it. Painting is an easy way to get the look of the real deal. 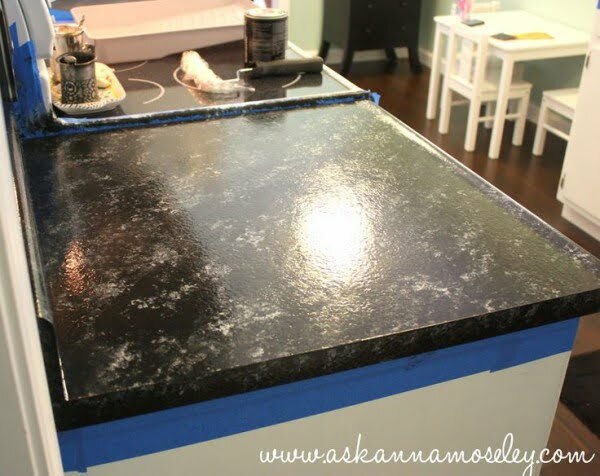 This tutorial shows how to paint your laminate countertop for the faux granite look. If you’re going to paint it, you might as well be creative about it. Choosing chalkboard paint gives you a statement matte black look and a surface for notes or even art. Wood looks fantastic, and it’s surprisingly durable as a countertop. It’s a lot easier to make than concrete and a lot cheaper than granite, marble or quartz. And it is a natural material which is always better than laminate. Going with an unconventional design, this idea for a countertop made of pennies is simply brilliant in its creativity. It gives the decor that metallic copper finish too, which makes a great accent. 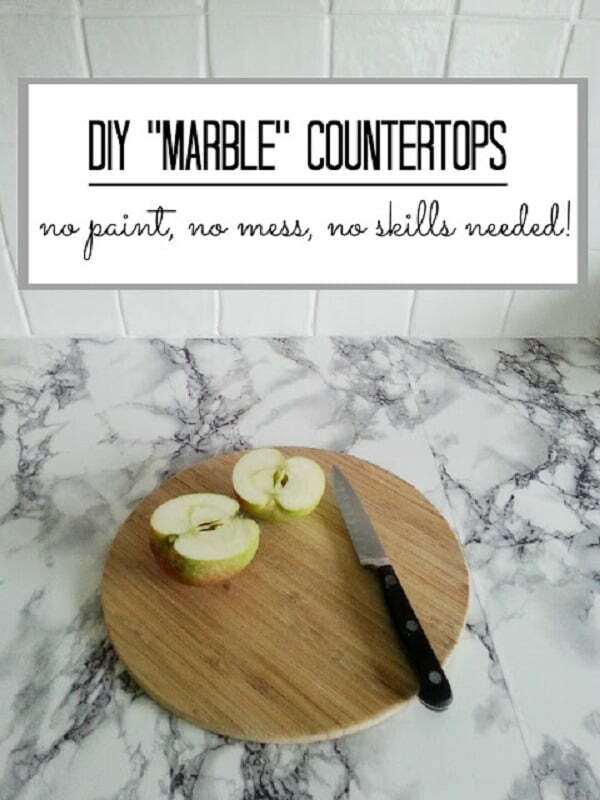 If you’re a fan of marble, here’s a tutorial for you how you can paint your laminate countertop for the faux marble look. If you hate painting, you have an option to use contact paper that comes in the marble pattern. 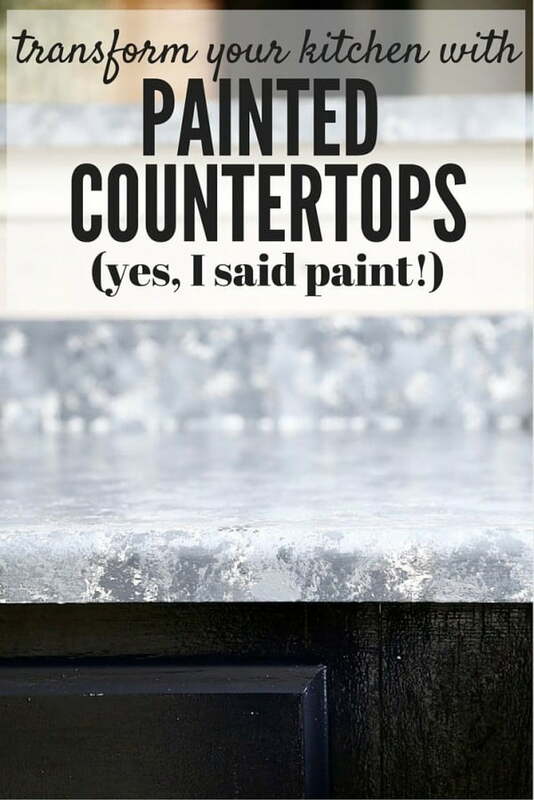 It’s the easiest and a non-messy way to update your countertop. Yes, you have heard it right! 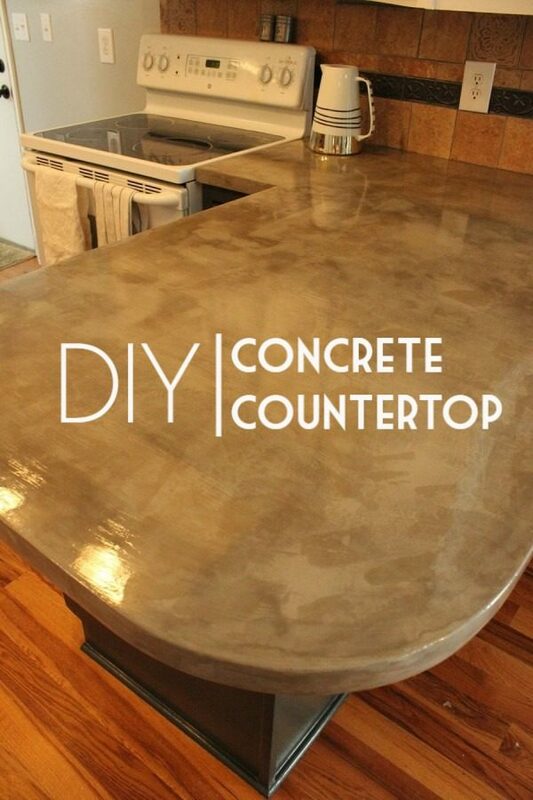 Although not many may believe that a concrete countertop can be DIY-ed, this great DIY guide shows you how. It may mean a few hours of sweat, and you need to be careful about a few things (follow carefully the instructions given on the guide), but once you have performed a neat job of it, you would feel all the happier knowing this beautiful countertop is but a fruit of your labor. How about creating/painting the veins on your marble kitchen countertop all by yourself!! No, we are not talking crazy. This awesomely innovative DIY tutorial teaches you how to ‘faux’ Carerra marble to make it look like a Saarinen marble top. As shown in the tutorial, get the hang of it by first trying it on a marble top (as in the IKEA Docksta top in the guide), and once you get comfy with the process, you can perform it on your countertop. This one again will take some time and a lot of patience on your part. But if you want to save a sizable amount of bucks on your kitchen remodeling, it’ll be worth it. 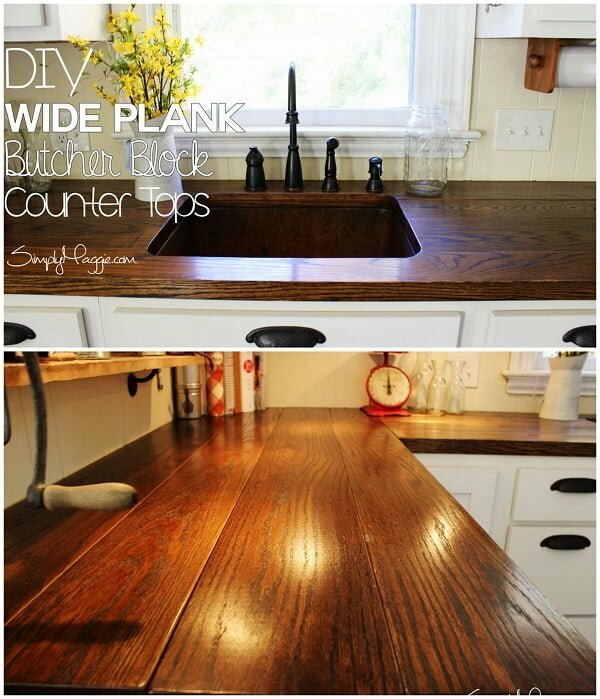 The tutorial shows how you can turn plain IKEA butcher block countertops into awesome-looking stained countertops for your newly makeover-ed kitchen. We love this walnut colored wide plank style countertops made of red oak boards. You may need to invest money upfront on getting some necessary tools (if you don’t already own them), but these DIY projects are worth all that investment when you consider the fact that they let you get some awesome countertops at almost 1/10th the price of similar products up for sale. 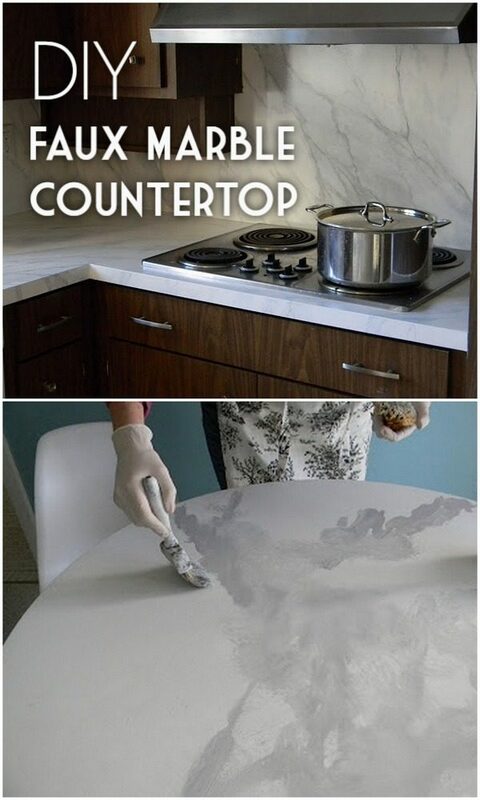 Don’t quite like the look of your existing countertop? 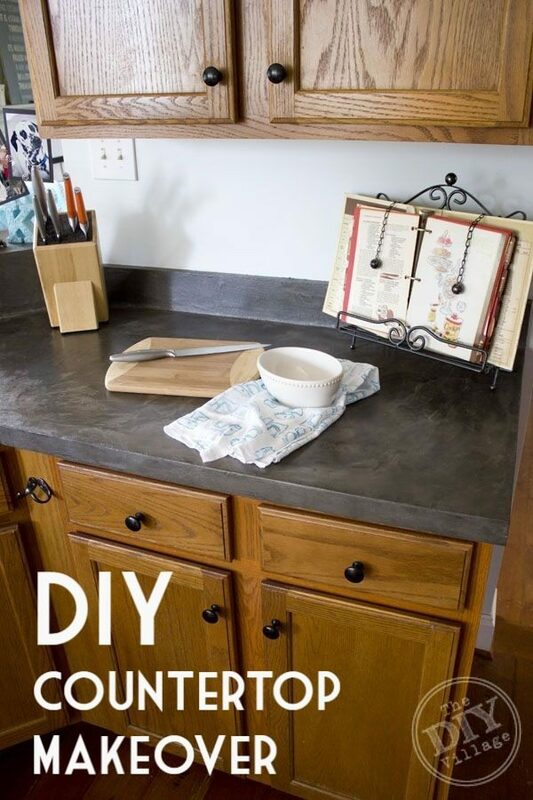 Check this DIY countertop makeover project tutorial to learn how you can refashion your kitchen countertop at a small expense. The tutorial uses ENCORE countertop kits for the project, but you can choose something else if that helps your budget. 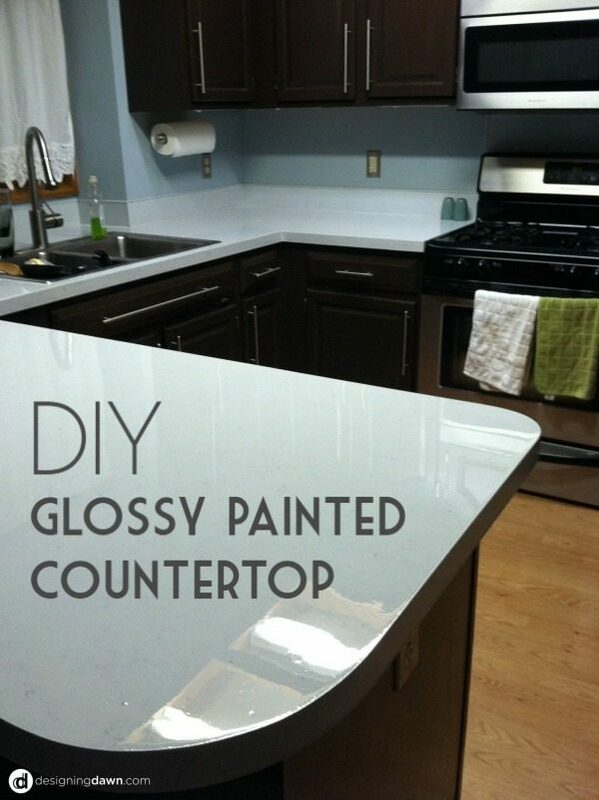 Want DIY kitchen countertops with a glossy stone look? 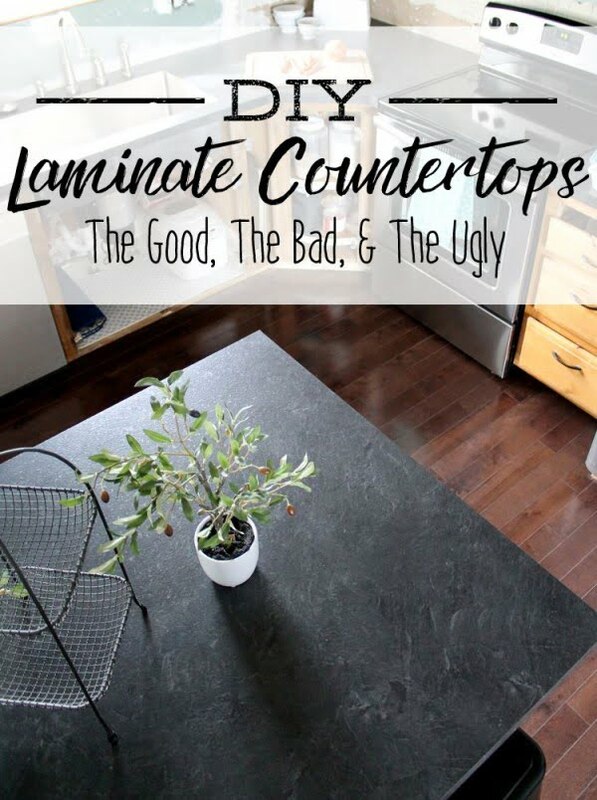 Follow this tutorial to learn everything you want to know about how to laminate your existing kitchen countertop. This project will help you give a fresh look to your kitchen and at a budget under $150! Another paint laminated countertop which helps you get a granite look! And at an even smaller budget than the previous one mentioned. The DIY-er in the tutorial himself admits how he was a tad nervous at first trying out this project, but he did manage to pull off a great job. Check the guide to find how. 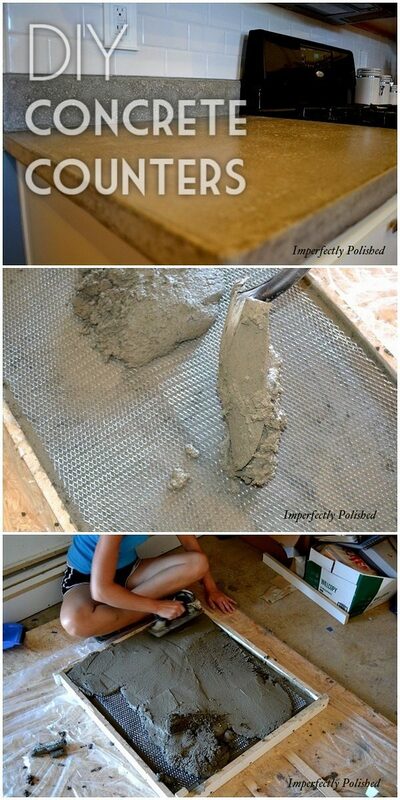 Another DIY concrete countertop project and again it may look a bit overwhelming from the outset. So, if you need motivation, merely think about all the precious bucks you will save doing it yourself and the photos posted should be enough to convince you that the finished product looks no less beautiful than the readymade bought ones. This tutorial will, in particular, teach you about the pouring and curing process involved in the job. Another greatly stained countertop fashioned out of IKEA butcher block countertops. According to your taste, you may go either for darker or lighter shades for this distressed wood counter. This DIY project will take you about a week to finish. 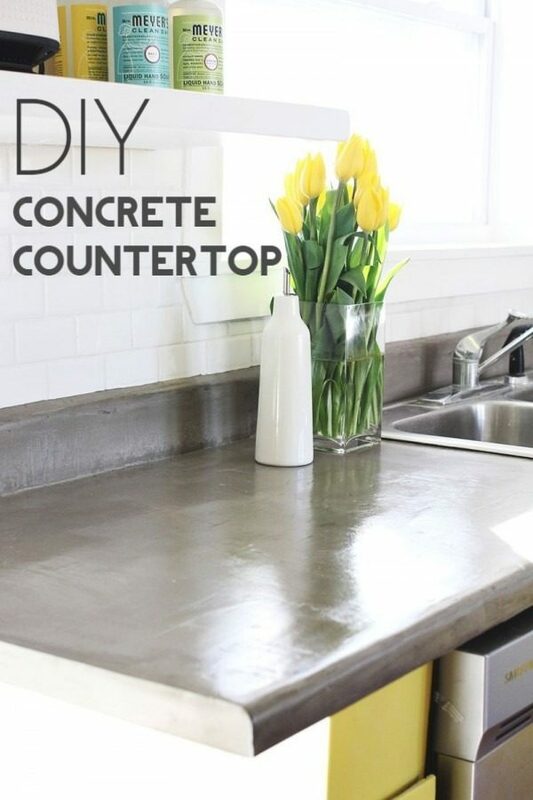 This great tutorial shows you how to transform your old laminate countertops in concrete looking ones with the help of a concrete underlayment. Follow the step-by-step guide of the tutorial to learn how to spread and seal this underlayment on multiple layers over your countertop to give it a radically and refreshingly new look. This one we love especially for its unique and elegant look which would all the same fit pretty well with all sorts of décor. This one is done on a plywood base, and you would need some patience in arranging the small wood blocks in the right pattern, though otherwise, it is pretty simple and easy to follow. How about a decoupage kitchen countertop pasted all over with vintage cooking recipes? If you have a taste for the quirky, you will love this one! Check out the tutorial to know how it was all done. Even if you don’t do it, it will be an enjoyable read all the same! We would leave you with another great tutorial on how to laminate your kitchen countertop to get that beautiful stone look. This one, in addition, comes full with great suggestions on how to get different stone looks (marble, granite, etc.) for your countertops.